Black Friday shopping made easy – go online! Black Friday is almost upon us. 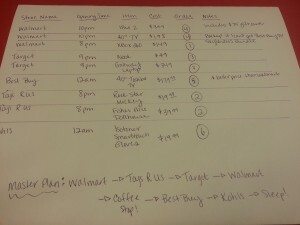 So, how exactly do you get organized for shopping on Black Friday? Don’t wait for the Thanksgiving Day newspaper to arrive full of store flyers. Instead, go online. Most big-box stores post their Black Friday deals on the Internet at least a week in advance. There are also TONS of Web resources that can help you decide which stores are worth braving the crowds for, and in what order you should shop (depending on what time the store opens). I like to start my Black Friday planning by creating a spreadsheet that includes the following: Store Name, Store Opening Time, Item and Cost. If you aren’t an Excel wizard, no worries, you can make your list on a regular pad of paper. a master copy that you can tick off once you’ve hit the stores. Make sure to group stores that are in proximity to each other, so that you can make the most of Black Friday. Doing these things will help you shop efficiently and will prevent you from getting sucked into impulse purchases that eat into your holiday budget. There are many other Black Friday ad-compilation sites out there, but I find that Brad’s Deals is the most user-friendly and organized. You can also follow this site on Facebook or Twitter. Facebook pages: Like I said above, you can follow Brad’s Deals on Facebook to find out about new Black Friday deals, but you can also follow Black Friday Ads. I also follow Hip 2 Save on Facebook. This site posts daily deals/coupons for many Web sites/stores and also posts new Black Friday ads. Apps: If you’re an IPhone user, Brad’s Deals is great. If you have an Android phone, you can download Smoopa, a free price comparison app that tells you if there’s a cheaper price online. I also have the Amazon mobile app open when I’m shopping… you can scan a barcode and price compare immediately. **Writer’s Note: I also like to look for Black Friday deals on Amazon.com….they offer Black Friday Lightening Deals which are offered until inventory is bought out. You can subscribe to their daily deals emails to find out what’s new every day. Many times I’ve found a better or similar price on Amazon.com and have chosen to skip certain big-box stores on Black Friday.